The fruit trees aren’t in bloom here yet. Your photos make me anxious to see that short lived beauty in my neighbourhood. Thanks for sharing. Hi Candice. 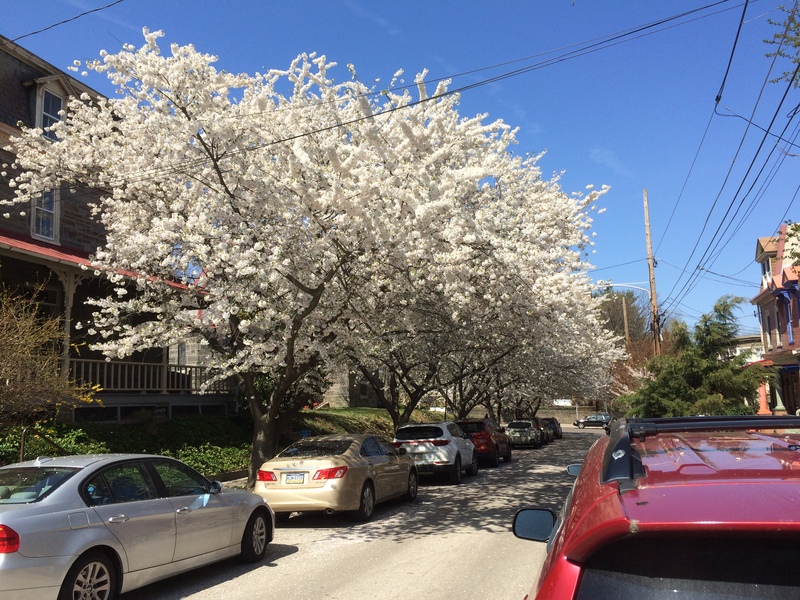 Flowering trees put on a grand show. Enjoy yours when it happens. We are having a very late autumn in Australia. The trees are confused and nervous about the winter not coming at all. Should they keep their leaves? Hello Gerard. All around the world, nature seems to be out of whack. Climate change! Thankfully there were no bears on the streets I walked around on! Outside my upstairs window is a blooming and glorious happy redbud and beyond it, Lady Willow luxuriously switches her new beauty. Spring was a long time coming this year. Thank you for such glorious photos. Thanks a lot for stopping by, Janet. Much appreciated. 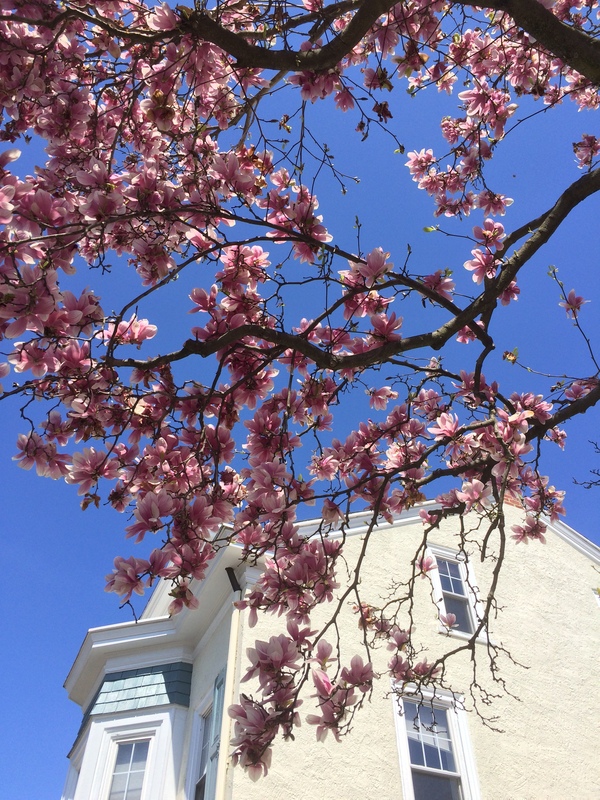 Enjoy spring while it lasts! As a child in the 60’s living in Alexandria VA. the first school field trip was to Washington DC. The memory that struck me the most were the cherry trees. To this day when I see a cherry tree I remember that trip. 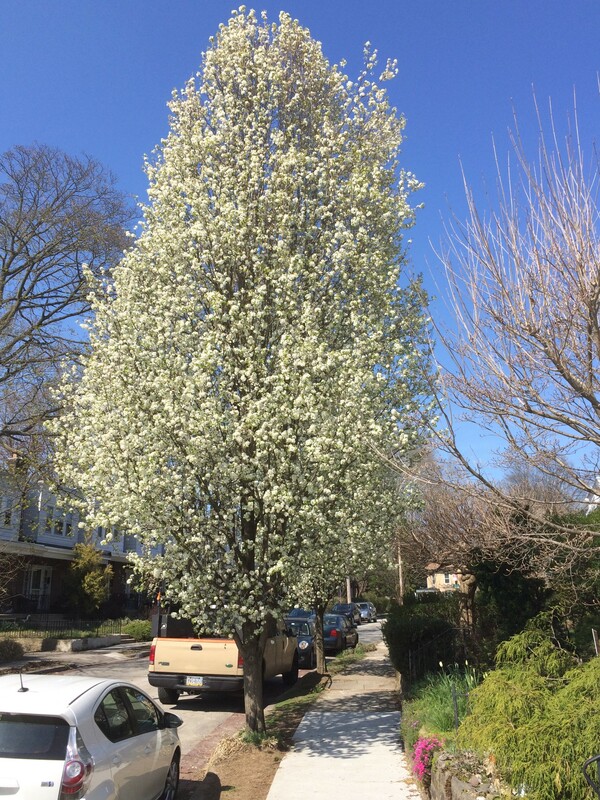 Trees are beautiful anyway, with or without blooms but it seems the bloom gives it that extra special moment when it wants to show off to the world. Thanks for the post. Hi there. You’re right: Trees are beautiful year-round. They are great creatures. Don’t mean to brag, but here in Bloomin’ Victoria, Canada, most of the plum and cherry trees are finished blossoming. Spring was cool and wet, but they performed anyway! So glad you posted the accurately identified flora! Karen, from the Awbury Arboretum, was a huge help to me. I’d have been unable to identify any trees without her assistance. Great photos! The main street near our flat in Edinburgh, West Savile Road, is lined with beautiful pink cherries, but like where you are, they’re only now coming into blossom whereas normally they’d have been out 3 weeks ago at least. Hey, Andrew. I guess that Scotland and Pennsylvania are on the same timetable seasons-wise. Aboretums are a great inspiration. especially for the dawn oif Spring. Another lovely excursion. Love the photos!!! Thanks a lot for visiting, AOC. Always good to hear from you. Enjoy the day! Lovely trees. Blossom is so beautiful. We have a pear tree in our garden and the blossom often seems to coincide with wet and windy weather so it doesn’t last long! I need to go out again soon for another stroll, before all the petals are gone from the trees. The fresh air always does you good! I was impressed that you knew all the names of the….then l found out that you had help. Nice article and pictures. I needed a lot of help, and I got it from Karen at the Awbury Arboretum. Thanks for being a very loyal reader, Joyce. I appreciate it! 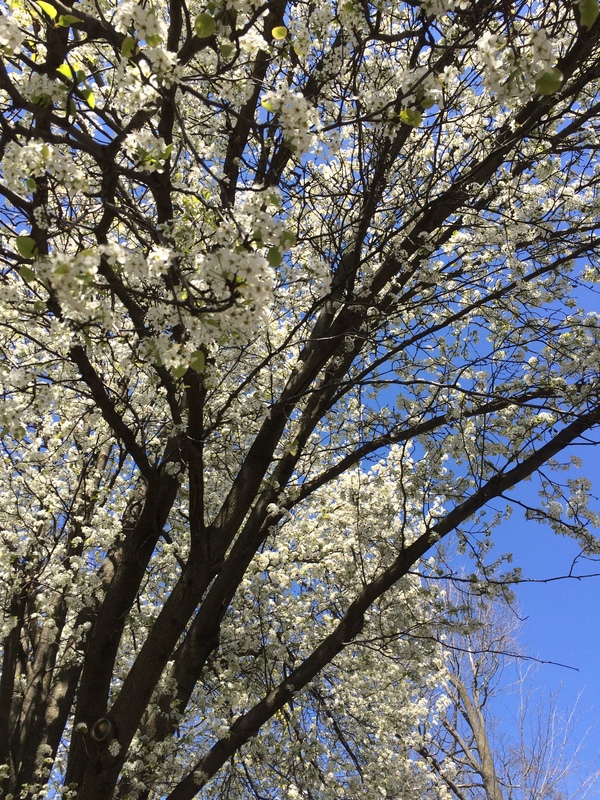 The blossoms are on their way! Beautiful… even better than truck art! Much more scenic than a parking ramp stairway! We don’t even have leaves on the trees yet here. Hi Marie. I hope that spring arrives soon in your neck of the woods. Really glad to read your post, and see your pics – – yeah, we’ll all have to keep working on the zen thing and find a spot for petal-bathing. I feel the same way in the fall, but turns out, climbing around a maple tree with superglue, to keep the beautiful foliage up there, just isn’t practical & it annoys the squirrels. I first went up there, to see Wissahickon Heights/Chestnut Hill, because I was interning at the Philos. Soc. archives, and helping with the papers of Henry Howard Houston II, whose grandfather built the railroad and a lot of houses there. Whenever I settle down, it should be a neighborhood with flowering trees and a cricket club. Hi Robert. Didn’t know that you’re familiar with Chestnut Hill. Right, there’s a cricket club! Can’t be too many of them in the USA. I think baseball and football are just fads, and feel pretty certain we’ll switch to cricket and rugby any day now, about the same time I can afford a house in that neighborhood. That it pays off to heed inspiration whenever she knocks, your lovely post proves! Here is to springtime, Neil. Thanks a lot, Tanja. You made my day! Who can resist spring when it FINALLY arrives? Lovely post. Hi Melissa. Glad you enjoyed this story. Have a real good rest of the day. I can feel a sneezing fit coming on but blossoming trees are always a glorious site! Hello there, JT. Trees are very amazing. Got to love ’em! Neil, did you guyz somehow dodge the wintry week of April 14-21? We had snow every day (or freezing rain, which in life-and-death terms for both plants and humans is more dangerous). Well, now we are at 86F which is my idea of heaven–flipflops, tank tops, fans whirring peacefully as I write. But, as your pictures so beautifully express, blossom time in spring is visually the most stunning season. Keep walking, my friend. I think the weather was okay here during the week you mention. Right now it’s around 88 degrees F. Too hot for me. My fave temp is about 68 degrees F.
Neil, one of the few perks of getting older is being able to ‘smell the roses’ (read gaze at the trees) without feeling guilt that you should be doing something else. Seriously though, your photos have changed my assumptions about your city. Philly is showing her pretty knickers. Hi Lynne. Philadelphia has some beautiful neighborhoods and parks. I think that Phila’s parks encompass more territory than those in just about any other city in the USA. 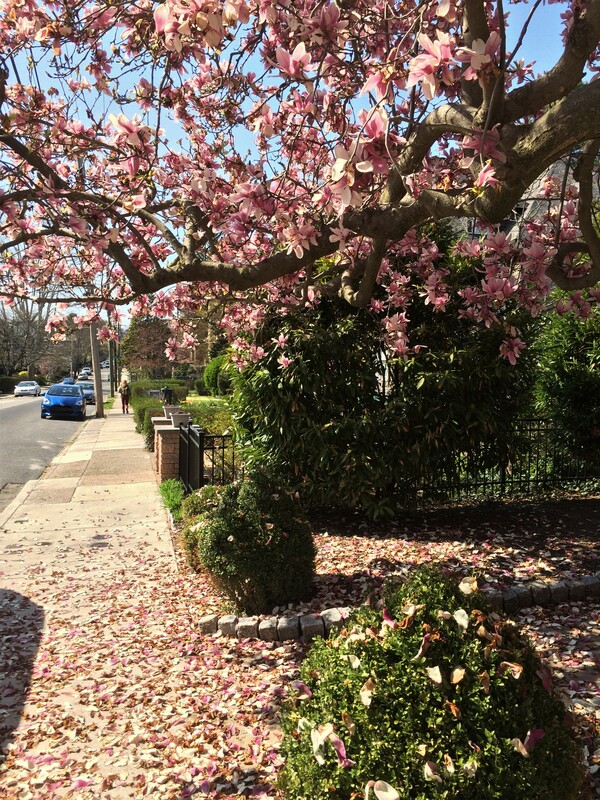 That was a beautiful Spring stroll through Chestnut Hill. I would have written about it too! Ann, I’ve got to say that I get a kick out of these kinds of excursions. And having the opportunity to write about them makes me more apt to go on the excursions. I’ll be seeing you. Enjoy the upcoming days. The Atlantic lies between us, but here in the North of Scotland the same trees have suddenly burst forth with blossom – I really thought the spectacle was going to be delayed this year what with the cold snap in March but not at all. Some lovely pics here Neil – Just such a shame the blossom lasts for only a couple of weeks. Always next year. Yeah, it’s something to look forward to, for sure! Beautiful photos, Neil! For next year’s spring excursion, I suggest a sunny day stroll along Kelly Drive. The river, the sculpture, and the flowering cherry and pear trees make stunning scenery. I couldn’t live in the city without flowers and trees! Excellent idea. That’s probably the best-looking part of Philly. Perhaps a second career as a photographer is ahead for you, Neil 😉 I’m loving those trees although like you say such a shame that the petals fall so quickly from their branches. I’m going for a walk today and will be sure to take notice of the trees and think of your well-written post. Enjoy the walk, Christy. I suppose that spring is the best time of year for walks, although autumn is awfully good too. This is a beautiful post from the beginning to the end. The cherry blossom is breathtaking. 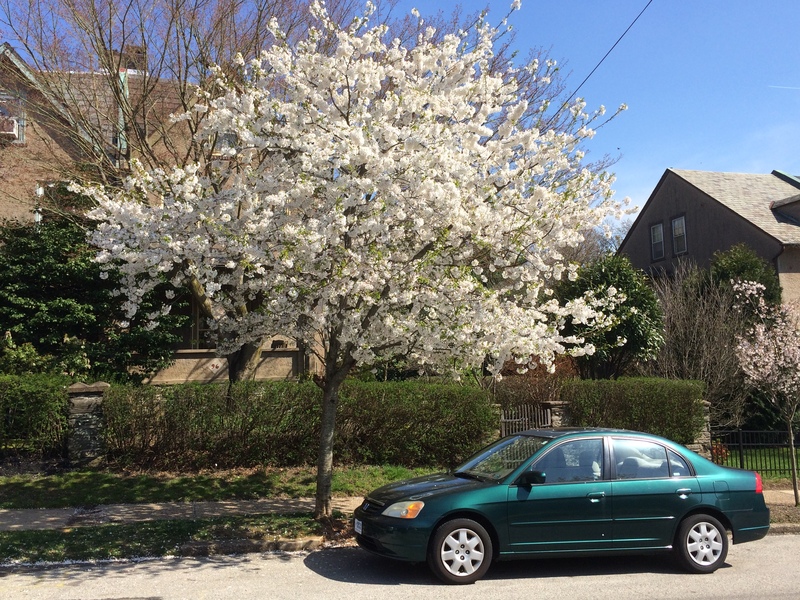 The image of creamy-white blossoms combined with your deep-green car makes it the perfect finish of the post. Lovely. Hello there, Isabelle. I’m glad I took that photo just before I headed home. I hadn’t realized that my car was parked next to a good-looking tree. There you go again. Getting all nature like. When it comes down to it, you have found something that people just never get. Hang onto it. Yup. I enjoy it every chance I get. Like right now. Later Neil. Oh, beautiful, beautiful! Not yet in Maine, but soon! Hey there, Laurie. It’s worth the wait! In my part of Pennsylvania, leaves finally are coming out on what had been barren trees. Green now is everywhere, and will be with us for the next five or six months. Thanks for the visit, Annika. Much appreciated. 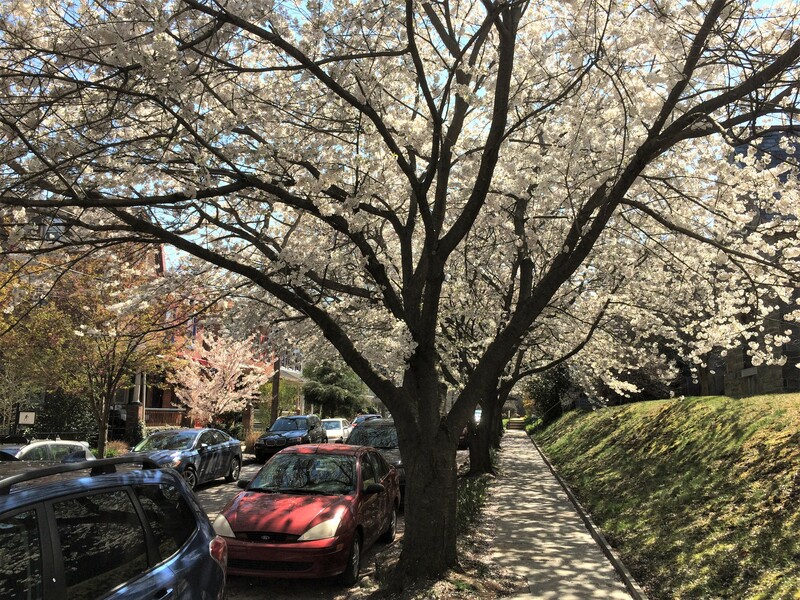 Wow – the blossoms are astonishing. 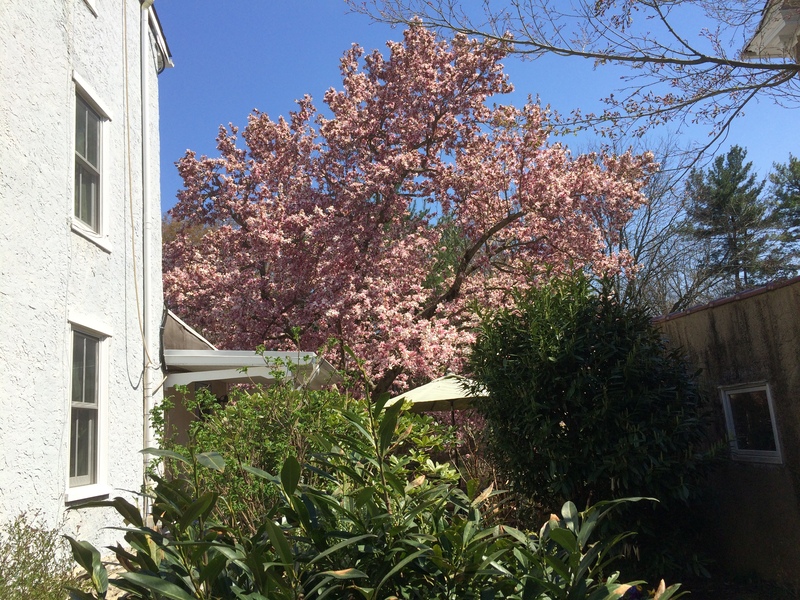 Our cold weather in the deep south has delayed everything – not even a crape blossom. I have been to Philadelphia a number of times, but never to Chestnut Hill. I don’t live far from you. Up here 60 miles NW of Philly in Reading, PA.
Hello Les. Thanks a lot for dropping by. The northwest section of Philly has very interesting areas: Chestnut Hill, Mt. 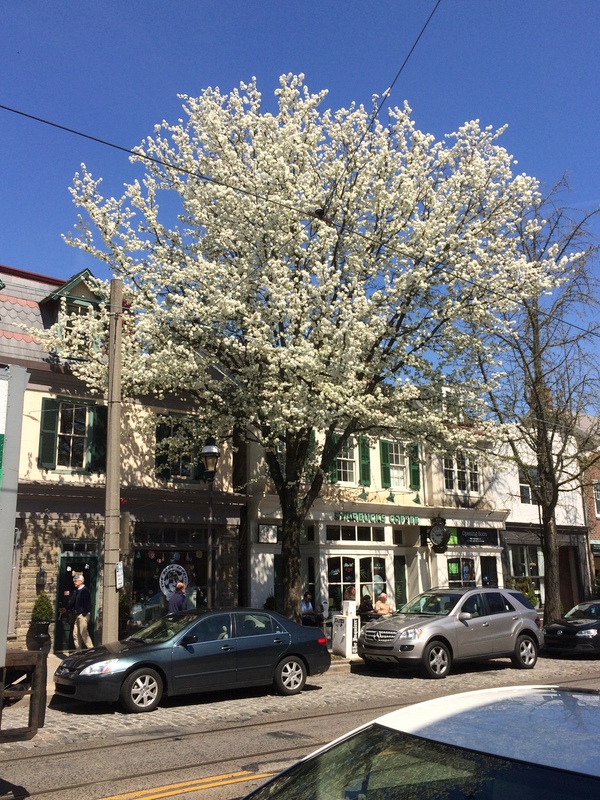 Airy and Germantown. All are worth a visit. Just gorgeous. Thanks for brightening up the springtime! It was a good day for a walk! Good to hear from you, Fran. See ya’. Lovely, it remind me from my now ex-neighborhood of Los Angeles, I got a lot of pictures I took in the past of the amapa flowering trees,and many others, like the ceibas, that grace the street every year, unfortunately I am at lost of how to upload my own pictures to wordpress, blame it on my lack of savviness with computer skills, in how give the pictur an url otherwise I would share with you. Hi. I’d never heard of the trees you mention. I took a look at them online. They’re beautiful. Definitely one of the best parts about spring. We don’t have anything fancy like you do, mostly redbuds, crabapples, and apple tress, but when the trees are blooming, it smells wonderful! Flowering trees are a real treat. A great part of nature. Wouldn’t it be something if ALL trees flowered? Unlike the east coast and midwest, spring for us showed up right on time, and summer is showing signs of an early entry with a near record lack of rain for May. Whenever it shows up, it’s always a pretty time of year. Hello Dave. You can’t beat spring. Or maybe you can: I think I like autumn best, though part of the reason is my birthday falling in October. I go to Chestnut Hill pretty often. I saw a play there a month or two ago at the Stagecrafters Theater: Race, by David Mamet. It was very good.